I wrote a post just over a year ago about Tokyo’s plan to get new ジャイアントパンダ (“Giant pandas”) to replace the one that died in 2008. Well, now after nearly three years without a panda, Tokyo’s 上野動物園 (Ueno Zoo) has two five-year-old pandas. Japan welcomed the male 「比力」 (Bili) and female 「仙女」 (Xiannu) the day before yesterday (Monday, 21 February). Those names, by the way, are the pandas’ Chinese names…Ueno Zoo will rename them shortly from a long list of potential new names submitted by people all around Japan. The pandas were flown to Tokyo from China via Japan’s “All Nippon Airways” on a special “Panda plane”. 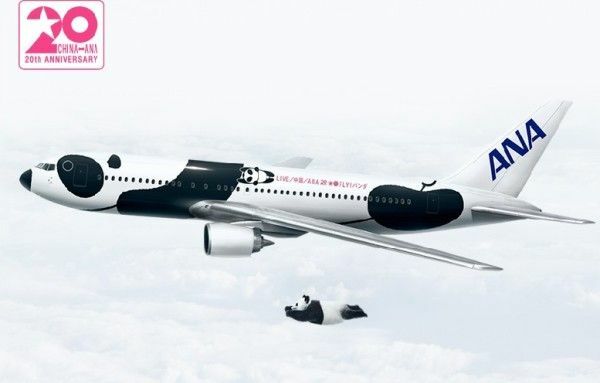 This plane actually wasn’t painted to look like a panda for this occasion…All Nippon Airways (ANA) had this plane designed like this to commemorate the carrier’s twentieth anniversary from it’s first flight connecting Japan and China. It took so long for Ueno Zoo to get new pandas after the previous panda died because initially Tokyo declined China’s offer for new pandas because of the steep rental that China charges zoos around the world for a panda. But there are a number of zoos in the Tokyo area and each one has a signature animal that is a major draw for visitors. Ueno Zoo has been well-known for the panda since it first acquired one in the ’70s. Without a panda the zoo was losing money…so Tokyo agreed to pay the ¥80,000,000 per year (about US$966,000) for the pair of pandas. In addition to attracting more visitors to Ueno Zoo, it is expected that the arrival of the new pandas from China will help improve the image of China among Japanese people…and thus help improve Japan-China relations. So, in a way, they are unofficial ambassadors to China in Japan. It was announced that the two pandas have recovered fine from the stress of their trip. They will be given time to get accustomed to their new surroundings before they make a debut for the public in Japan…which is expected sometime in March (2011). Does your city’s zoo have pandas…or another unique animal? ← Is my music collection considered “oldies” now?